Back again. I know; so soon! Am I bored? Nope: in fact very busy making a special quilt using material donated to raising funds for cancer research. However, I took a moment to try and get some pain relief as quilting and bad backs don't seem to get along very well and I read through my blog lists. And as I read your blogs, I found other blogs (oh so many!) so will be adding to my already very full blog reading list. Can you help me? If you have found my blog in the last three months can you let me know? Leave a comment and I trace it back to your blog and add it..otherwise I end up all over the place. I was reading a great post from Shirlee at the Easily Influenced Stitcher's blog about how she wishes people would show their wishlists. And it made me wonder why I didn't. I'm in an amazing RAK blog and I know it might be helpful for others, but actually it would be quite helpful for me. Do you remember the dreaded chemo brain? It is a side effect of the chemotherapy which is linked to breast cancer drugs. Well, it isn't really much better. I am a divil driving...I forget where I'm going, where I am and really am still not safe driving long distances. And get this: I run a craft club and a lady came for the first time. ' Wow' says I. ' You look so familiar, I know I know you from somewhere! '.......and durrr..I had only been sat next to her for three months in the quilting group I used to go to...and that for me is the norm. I can't remember faces, names, lists or anything and although when it first hit me I got really upset, being a control freak who normally knows and remembers everything, I have got used to it now and try not to stress about it. So I know I need certain things for stitching but I never, ever remember what it is I need and so I don't get them. So I am putting up my wishlist. On a final note, well two notes actually. Please, please vote for your favourite butterfly. There are only two days left for voting! And, because it is St Patrick's day soon, how about a paddy's day freebie? This is just available to my blog readers: it wont be on the fb page at all, because fb is for me a networking site; I know I have friends on there, but there are also a lot of people I don't know. My blog however, over the years I feel I've got to know you all and you've been such a support to me. So just for you I am offering the Erin Go Brach Holmsey and Fergus Cross stitch chart and story. If you would like it, please email me on stitchersanon@outlook.com and I will email it out to you as a pdf. I can't work out how to attach the chart and don't really have time at the moment to mess around re-saving stuff...so I hope you understand. I can just attach pdfs to emails with no problem at all. I guess one of these days, I will get around to organizing a wish list! It is a great idea. Thank you so much for offering your freebie ~ I'm off to email you! It is called "Of Fiddleheads and Floss", and I am just picking it back up after years of neglect. Well, I had the best intentions when I started it but life happened, password got lost, computers and jobs changed, I moved...so after finding your blog and following it for the past few weeks, you have inspired me to get my blog back up and running. Thank you for the inspiration! Have a wonderful day and enjoy working on your quilt! I'd love to see pics of it! 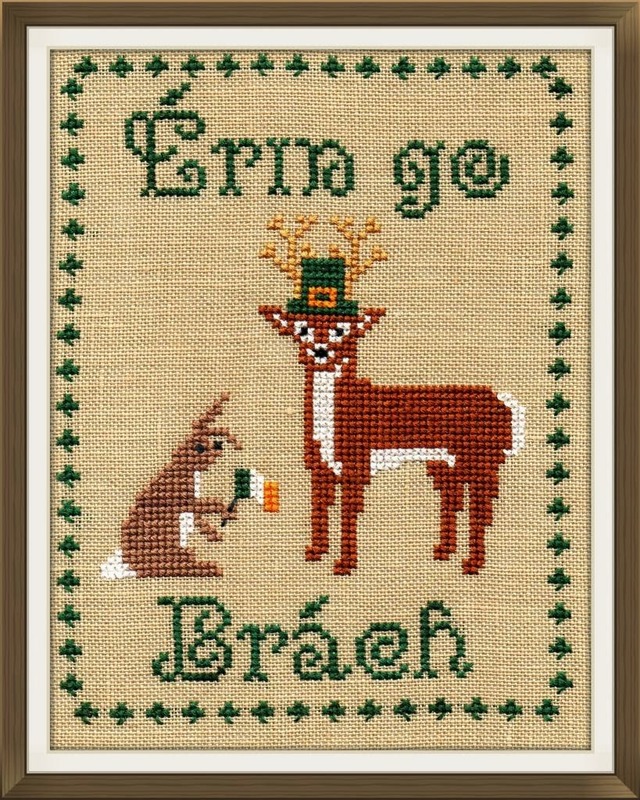 I have sent you an email Erin Go Brach Holmsey and Fergus Cross stitch chart is gorgeous. I've had a wish list for a while but it's more for me to keep a track of things I have seen that I would like lol! I think they're a brilliant thing to have though and am glad to see that Shirlee has put one up too. They're handy if you want to stitch someone a little gift as you can look and see what their tastes are. You are too hard on yourself! You get LOTS more done than the average person, believe me! Sadly, tho I did a different type of chemo, I too, have those forgetful times... I went to our last work Christmas party, and tho it was only a YEAR, passed many by because I didn't remember them. Kind of embarassing! I am thinking about starting seeds now... maybe next week, if I feel better. Gotta get moving. You are an inspiration... Hugs! I haven't got a wish list, there is nothing I am wishing for ... except an hour or two extra to my days, or another day in the week ...lol.